Find hotel near Berlin Gesundbrunnen Stat ..
Gesundbrunnen Bunker is one of the very few bunkers left in Berlin which are a representation of the horrendous past that Berlin has gone through. Today, it is an underground station known by the name of Gesundbrunnen which has some underlying bunkers from the past. Here you will come across an abandoned bunker which you will have to see closely as most public ends up missing it. You should definitely visit this place for it was one of the most prominent places during the war. How popular is Berlin Gesundbrunnen Station? People normally club together Volkspark Friedrichshain and Warschauer Strasse while planning their visit to Berlin Gesundbrunnen Station. Berlin gesundbrunnen is a great connection of trains.The station is situated in Mitte, the center of Berlin.The Station is also connected with gesundbrunnen Centre a huge mall.Outside this station there are so many food shops.From gesundbrunnen we can take RE, RB, S1, S25, S41, S42 and much more.This station is the biggest one in Berlin. New and well maintained station. Easy to access and find your way... but it needs more cleaning attention. I don know why is like that in every station but trails and stations need more cleaning. There's a great cold war bunker tour here that you experience. It's one of the most interesting things I've experience in Germany. Well worth the time and money spent. Not sure what the normal cost is. I did a tour with a language school for 10 euros. 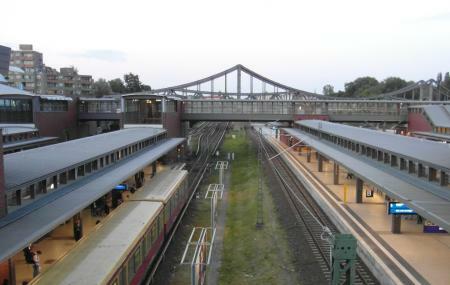 The train station Gesundbrunnen is located in Berlin's northern district Mitte. At Gesundbrunnen, long-distance trains stop as well as regional trains heading north and towards the Baltic Sea. The station has direct links to the S- and U-Bahn network of Berlin. Service Point of Deutsche Bahn opening hours: Monday to Friday 08:00 - 20:00, Saturday and Sunday 10:00 - 18:00 Timetable Service of Deutsche Bahn Station Berlin Gesundbrunnen (DB Website) Lockers: Lockers are available at Gesundbrunnen station. It's a very big station, but not too sprawling. It's a nice northern Berlin option for many RE and ICE trains. We are much richer for having it. Not many food options. Well covered for the Winter. Would use again.